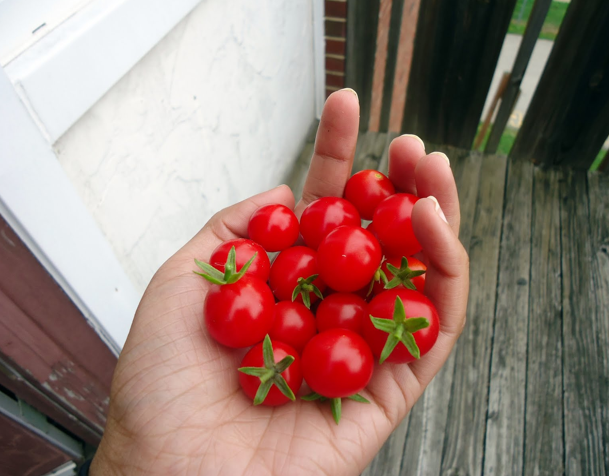 Love tomatoes but don’t have your own garden? Just because you live in a sectional title property doesn’t mean you can’t be an organic farmer… You can grow food on your balcony as long as the area gets 5-6 hours of direct sunlight per day. Set your container in it’s final location before filling it. Place the small rocks at the bottom as described above. Fill container with the potting soil and tomato fertilizer. Dig a hole and place tomato plant deep down, then press soilless potting mix back around the plant. 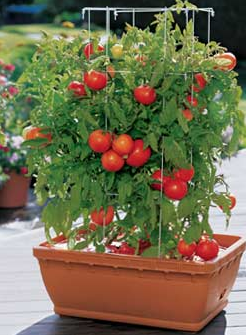 Place a tomato cage around the young plant before it grows too much. Container plants are more sensitive to soil temperature changes than their ground planted friends. They’ll need to be watered frequently in hot weather and may even benefit from being taken inside on very cold nights. Once the tomato plant starts to flower and bear fruit you will need to add more fertilizer and potentially even more potting soil as the nutrients from the soil get absorbed into the plant. This entry was posted on April 8, 2013 by Paddocks in Gardening.